You know that feeling when you nail a really simple outfit but it looks so right? That's the goal we're chasing today. So rather than anything fussy or complicated, we're zeroing in on the combinations and pieces that work hard without you having to spend time assembling ensembles 24 hours in advance or being late for brunch. Again. Some of our favourite fashion bloggers have been scaling their looks back a notch or two this week—meaning some laid-back inspiration has already arrived by the truckload, just in time for a very chilled weekend. So if you aren't required at yet another wedding (and if you are, here are some excellent guest dresses to snaffle at the last minute), we suggest you take some top fashion tips from the girls here. Style Notes: Dodo Bar Or's Amal Dress (£470) is the perfect holiday buy, but just look at the city mileage you can get out of this beaut. With the simple addition of a white tee and sneakers, Camille Charrière of Camille Over the Rainbow has elevated it no end. Style Notes: Breathing new life a 1960s-style shift dress for a 2016 stroll around New York, The Haute Pursuit's Vanessa Hong kicks this cute frock into the here and now via a gigantic Fendi Dot Com Bag (£2303) available in Cuiuo and equally hefty skate sneaks from Eytys. Black and white, it's always right. The ultra-glossy finish puts these sneaks into luxe territory. Style Notes: Natalie Suarez from Natalie Off Duty has that done/undone thing mastered. Here's another great example with her white shirt casually hanging loose and revealing a peek of bralette. The mannish shirt contrasts with a leather mini—as do the sensible Tabitha Simmons Lori Sandals (£744). Summer bags don't get better than this. 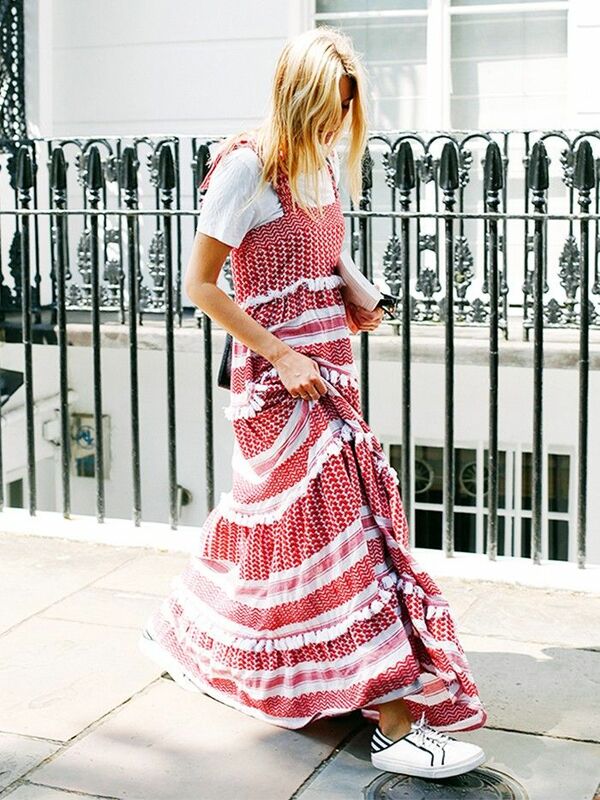 Style Notes: When you want extra wear out of that ultra-summery dress but it's genuinely not summer outside? Throw it over some raw-hemmed jeans, slip on a pair of slides—Gucci Princetown Leather Slippers (£380) to be exact—and get thee out of the house. Nice work from Zina Charkoplia of Fashion Vibe. All simple ensembles benefit from hoop earrings. Style Notes: Time to pull out the slinky duster coat you've got at the back of your wardrobe. It's ready to be worn as a dress and over denim like Paige Skyline Boot Flared Jeans (£240), à la Shini Park of Park and Cube. A front crease is the smartest way to up your denim game. Style Notes: The easiest method for toning down a thigh-slit Christopher Esber skirt and strapped stilettos like those worn by Sara Donaldson of Harley and Harper is with an outsize white jersey from Double Trouble—bonus points for the embroidery. Christopher Esber is a brand gaining momentum—watch this space. Style Notes: Sandra Hagelstam of 5 Inch and Up is rarely seen in anything other than sky-high heels, but she's got the right idea here: A short hemline calls for slightly more demure footwear. Also, props for the shirt. Cuff action is strong at H&M right now. What will you wear this weekend? For even more inspo, see how to wear your favourite ankle boots right now.